We apologize that this photo is a bit blurred. 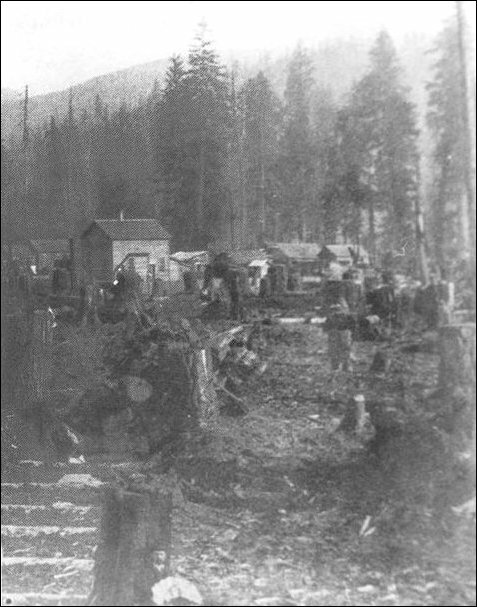 It is an enlargement from another photo, which was taken in the period 1888-89, halfway between old and new Sedro in the 600 block of Fidalgo street. 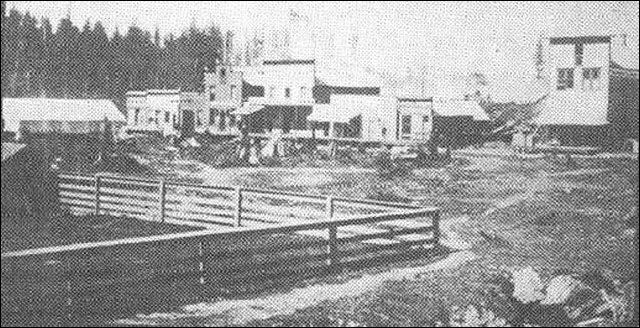 The building at the top is the office of the Sedro Land and Improvement Company, which was selling lots in the newly clear-cut town. Of interest to us here is the figure at the very bottom. He appears to be a very nattily dressed man or is he a hobo? Could it be Gentleman Jack from the story below? Read the story and decide for yourself. Frank's father, Samuel Wilkeson Jr., was corporate secretary for the Northern Pacific railroad. Samuel surveyed the Cascades in 1869 for NP. A year later, Frank accompanied an engineer named D.C. Linsley on a survey of the Skagit river and the North Cascades for NP in 1870. The town of Wilkeson, near Enumclaw, was named for his father while Samuel was secretary to the board of NP. Frank was also a "boomer" for the town of new-Sedro in 1889 and the town of Hamilton in 1891. Patricia has spent countless hours at Lehigh University, copying Frank's columns from microfilm of the Times archives; she then typed them into her computer. During the period of the 1880s through 1913, he appears from his bylines and public records to have lived at various locations in Washington, including Sedro, Fairhaven, Anacortes, Hamilton, Stehekin and Chelan, where he died in 1913. We are just going to give you a taste here, but what a pleasure for your palate. Frank's story of the most notorious hobo rapscallions of old Sedro is a real knee-slapper. We are sharing many more of his columns in our paid-subscriber edition of the Journal. By Frank Wilkeson, New York Times, Dec. 14, 1890 "I swipes things," Hobo Jack said, in reply to my inquiry relative to the ways and means employed by him to live. At short intervals during the past summer I was called from Fairhaven, on Bellingham Bay, to Hamilton, on the Skagit River. Both places are in Washington [Territory]. I had frequently to stay in Sedro, at which point the railroad then terminated, for from four to twelve hours and several times I remained there over night. To kill time I added two hobos to the list of my acquaintances, Hobo Jack and Hobo Paddy. The former was a handsome, well-built, fairly educated rascal from Baltimore; the latter was a short, stocky, large-headed, merry-eyed, and smiling Irishman. Both men were thorough hobos. They were professional thieves. They were never known to be sober, save on rare occasions when sobriety was necessary to execute successfully some rascality. But drunk or sober they were shrewd, conscienceless scoundrels. Hobo Jack affected cleanliness. He was a dandy among hobos. A strong affinity existed between Paddy and dirt — so strong that it might properly be characterized as an absorbing passion. A sincere affection existed between the two hobos. Jack possessed the mastermind, and Paddy not only loved him in a hoboish way, but he in addition highly respected him and was dreadfully afraid of him. A few words about Sedro, so that the [New York Times'] readers can understand the straits travelers were put to kill time in that town. It was a new town without any apparent future. Its only industry was to dig up stumps, to pile logs preparatory to burning them, to sell mean whisky and almost undrinkable beer to thirsty or merry men from Scandinavia, and to sell town lots to speculative people. As I have written, the town was new; there was no municipal government, no police officers, no Justice of the Peace, no court of any kind. No man had lawful authority to arrest another. Sedro was a pleasant haven for hobos. There they could safely drink to excess and howl and fight and steal, and no man could say them nay. Hobos and Scandinavians and scarlet women merrily danced in dirty rooms that had thrashing-floor-like floors, and that were alleged to be music halls, just as though music could be extracted from a combination of a cracked fiddle and a hurdy-gurdy. The latter is a particularly cruel instrument of torture out of which music is ground by turning a crank, and which has a range of four tunes. At Sedro the artist who turned the crank was usually a Scandinavian who had just arrived from some near-by logging camp, and who was more or less under the influence of liquor, but generally arrived at the superlative degree of alcoholism. I have written that the hurdy-gurdy was built to play four tunes; so it was; but I have heard a score of tunes — at any rate they sounded unlike — ground out of one of these dreadful machines by one Scandinavian, as he gradually and joyously traveled the alcoholic path that leads from 6 a.m. sobriety to 6 p. m. intoxication which was sleep-creating in his case. Gamblers, called tinhorn in scorn, swarmed around the open doors of the saloons as bees around a hive, and coaxed drunken and easily plundered men to play at their unfair games. There were no hotels. Travelers slept wherever they could — under tables, on floors, in lofts above barrooms, in sheds, and in saloons. Such was Sedro when it was young. Early one bright Summer morning I arrived at Sedro from Mount Vernon and missed the up-river steamboat and the tri-weekly stage. I was in for a day and probably for a night at the loathsome town. I walked to a canvas-covered saloon called the Sapp, in which was a famous hurdy-gurdy that had driven many powerful and abstemious men to strong drink, and under which hobos slept the deep sleep of profound intoxication. Waving good morning to the saloonkeeper, I passed through the gambling tables to the rear of the saloon and placed my light grip under lock and key beyond the predatory clutch of hobo's hands. Then I walked to the front of the saloon and seated myself on a long bench that stood on the sidewalk and was vacant at so early an hour. Sedro was asleep. It habitually kept late hours. The saloonkeeper joined me, and, as I was enjoying the glories of a Summer morning in the Skagit Valley, he told me descriptive tales relative to fights and robberies — the sole news of the town. Presently there was a noise under the floor of the saloon that sounded as though some impatient man was kicking upward against the floor. This sound was followed by low but exceedingly earnest imprecations directed against the architect who had placed the interior sills so low that it was difficult to crawl under them. The muffled voice sounded familiar. I raised my eyebrows inquiringly at my comrade of the bench and said, "Paddy?" "Yes," he replied. "Paddy is getting up. He 'rolled' a Swede last night and got drunk on a portion of the money. He was so drunk that he was afraid to go home for fear that Hobo Jack, his partner, would heavily fine him or beat him." The saloonkeeper was silent for a moment; then he added, as he listened attentively to the denunciation of the architect, which became more vigorous and especial directed against the well being of important organs that are necessary to healthful life. "Yes," he said, "Paddy is getting up, and he seems to be getting up wrong leg foremost." Which was indeed the case. Paddy crawled out from under the floor. He was very dirty. His shirt was in rags and his back was scratched. He was hatless. He staggered to his feet, caught sight of the saloonkeeper, and instantly began to abuse, in terse and vigorous English, the sleeping apartment he furnished his customers. He felt of his head, and discovered that he had no hat. The only logical conclusion was that the saloonkeeper had stolen it, and at that conclusion Paddy arrived instantly and he denounced the whisky seller ragefully, and offered to fight him for the hat and drinks, which offer the saloonkeeper promptly declined. Then Paddy recognized me. He thrust his hand into his pocket and drew it forth with silver, which he exhibited to me. His manner was as that of an intoxicated conqueror. In reply to my question as to where he had gotten the money, he, with perfect self-possession and as though he had performed a praiseworthy act, replied: "I swiped it from a Swede last night. Have a drink, Colonel?" he added hospitably, as he swayed to and for before me. Paddy was possessed of the idea that I had commanded a regiment during the late war, which I had not, and invariably addressed me as "Colonel." "No, Paddy; no drink this morning," I said. "Then I will have two," he remarked, and he did. After this slight refreshment he seated himself on the sidewalk, and engaged in hobo reminiscence, and I sat looking at his repulsive and dirty face and wondered how long he would live. As I gazed, his face blanched through its coat of dirt, and he started as though to rise. It was too late to escape. Hobo Jack, who bore a case of coal oil on his shoulder, strode from behind an immense cedar stump. He glared at Paddy savagely, placed the case carefully on the walk, and then approached Paddy, who vainly attempted to affect supreme composure, and stood in front of him shaking his long index finger in his face. Jack said: "You have ruined the clothes I gave you from the contents of the gripsack that I swiped day before yesterday. You have meanly and in a most unfair manner gotten drunk by yourself. Pay your fine for that offense before I go on," he said, as though in an aside, and extending his hand toward the crushed Paddy, who reluctantly thrust his hand into his pocket and drew out half a dollar which he humbly handed to Jack, and the cowed hobo's manner was as that of a beaten cur, and Jack, first pocketing the money, resumed his improving lecture. "You know," he said, "that to-day is pay day in the big clearing where the Swedes work. It will be our busy day. Here you are half drunk at this early hour, and would willingly get wholly drunk if I would allow you to so basely take the bread out of our mouths." Jack pretended to supreme rage, and dashed at Paddy as though to destroy him, and Paddy whined his fear. Then, imperatively, and with clenched hand and waving right arm to emphasize his words, he said: "Go home and wash yourself, put on clean clothes, then eat a heavy breakfast to sober yourself, and do you get ready for business." Paddy fled in fear-inspired obedience. "And," Jack shouted after him, "if you get drunk to-day before business is over I will murder you." Jack turned to me, and I was shocked to see that he, too, had been toying with the demon rum at so early an hour. "Colonel," he said, and his voice was thick with hospitable welcome and his bright eyes smiled with his red lips, "come have a drink with Hobo Jack," which invitation I most politely, but firmly, declined. Jack said that under the circumstances, he would have two drinks, which he did, and which apparently refreshed him greatly. "You stole it," the saloonkeeper replied, "and I will not buy," which blunt remark created an embarrassing silence for a few minutes. Presently the early morning drunkards crawled out of hollow cedar stumps and from under houses and wandered by devious paths to the saloon to drink cocktails and more cocktails in hopes to steady their jerking nerves and to quiet their rebellious stomachs. 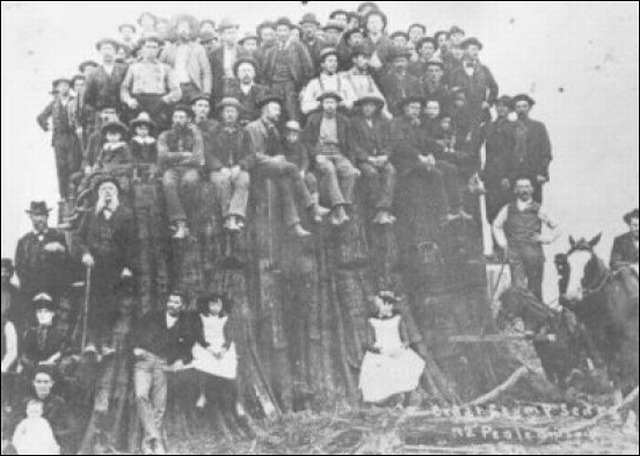 Photographer Frank LaRoche Sr. photographed dozens of Sedro's finest citizens, who were standing upon a stump in between Eighth and Fidalgo streets in new Sedro. The caption indicates this was taken on a date in 1892, nearly two decades before he moved here permanently from Seattle. The saloonkeeper left us, and Hobo Jack and I sat silently for a short time and then drifted into a preliminary conversation that became confidential, and which terminated in the remark which is the initial sentence of this sketch, and which I here repeat: "I swipes things," Hobo Jack said; "swipes things steadily, and I works a game, and a good game it is, too, on the Swedes on pay days and on Sundays. I make enough to live comfortably, and to keep Paddy, too." "Explain the game to me, Jack," I said. "I will if you will promise not to give it away," he replied. I promised not to betray him. He looked at me earnestly for an instant and then said: "Colonel, a few months ago a gentleman of Sedro could live fairly well on the gripsacks that he found. He could keep well dressed even if the garments did not fit him. Occasionally a drummer for a cigar and tobacco house would lose a bag or a small sample trunk and the fortunate finder would be well supplied with cigars, though some of those cigars were not good." Jack ceased to talk. He shook his head and puckered his face as he conjured up the taste and smell of that famous Skagit Valley cigar, "The Undertaker's Friend," several boxes of which he found in one gripsack that belonged to a gentleman who waved his hands wildly and palm uppermost around his shoulders when he discovered his loss. "Those were tough cigars, " he said, and then he resumed the one-sided conversation. "It was easy in those happy days of the infancy of Sedro to 'roll' a drunken workingman. There were no dance halls to absorb money that should be kept in circulation. Tin-horn gamblers did not then infest the town and rob honest hard-working men at brace gambling games. Paddy and I lived easy lives. The town grew. Gamblers and dancing girls flocked in, and an alleged hotel was built, and now it is a red-letter day if we pick up a gripsack. We are no longer particular as to its size or quality. Time was when I would not look in a business way at anything in the shape of a grip unless it were made of alligator skin. At present I am thankful if I find a cheap, black, oilcloth grip. And last week, Colonel," here his voice fell to a whisper and his head hung in shame "last week I swiped a Swede's roll of blankets, and was glad to get them." "Jack, I am dreadfully ashamed of you!" I exclaimed, in mock astonishment. "Well, Colonel, I acknowledge that it was not nice, but," he added briskly, and as though to cause me to forget the blanket business "but next day I picked up a bundle of law books that some fool lawyer was toting to Mount Vernon to enable him to make a bluff at a cheap Judge before whom he was to try a case that neither of them knew anything about. This lucky find gave me my idea. You may have noticed Paddy's head?" he said, looking at me inquiringly. I recalled that close-cropped and shovel-scarred head, and frankly acknowledged that I had noticed it and thought that it was a hard-looking head to expose to the eyes of a critical world. "It is a large, well-shaped head," Jack said, "and when you make Paddy put on a clean shirt, first having thoroughly washed his face, and seat him behind a table, he is a grand-looking man and far superior in appearance to any Judge before whom I have been tried on this coast." "The idea came to me with a rush. I would establish a court over which Paddy should preside. I would be constable and sole runner-in of drunken Swedes and make complaints against them, and collect such fines as the Judge in his wisdom and mercy should sentence the prisoner to pay. Arrived at home, I explained the scheme to Paddy. He fell in with it at once. We cleaned up the court room, and piled up the law books on the table. Then I cut a tin star out of the bottom of a fruit can and fastened it under the lapel of my coat, and, after I had fashioned a club, we were ready for business. We went to the saloons to search for drunken Swedes. You see," he said in explanation of his apparent leaning toward that Scandinavian people, "Swedes cannot talk English, they know nothing of our laws, and, though a hard-drinking people, they are law abiding and respectful to officers who represent the law." "We quickly found a Swede who had bought a semi-jag and had money in his pocket. We watched him for hours, during which time he passed from the semi-jag stage to the wholly drunken condition that results from too free drinking of poor whisky. Paddy hurried home, leaving me to care for the victim. I talked to him and extolled the excellence of the beer that was drawn at the Sapp. Presently the Swede staggered out of the undesirable saloon he had been drinking in and among the vision-obscuring stumps toward the Sapp. That was my chance. I hastened after him, grabbed him by the shoulder and said savagely, 'What do you mean by getting drunk in this civilized community? You have broken the law. Come along with me!' I brandished my club and made as though to strike him. I jerked him and swore at him. He begged me not to kill him, and walked as a tottering child at my side. Soon I had him before the first Judge, who with commendable promptness fined him $10, and who gave him ten minutes to get out of town. He paid the fine, and released he staggered up the railroad track toward the camp where he worked. "About dark I caught another drunken Swede, who was inclined to resist arrest. To him I showed my tin star. He looked at it and weakened and appeared at the bar, and was fined $5, after paying which he disappeared into the forest. We do not operate extensively, just sufficient to keep us in food and whisky. We habitually steal cases of coal oil, or fruit, or canned meats, and liquors," here his voice dropped to a confidential whisper; and after a quick glance at the bar where a thirsty crowd stood, he said: "Last night I swiped a case of wine from the whisky mixer in there. How he will howl when he discovers his loss," he added exultingly, and he filled a pipe and smoked calmly and listened attentively while I warned him of the danger he and Paddy ran in impersonating officers of the law and in establishing a bogus court." Old Sedro, all block of it. This is now approximately the same location as the parking lot for the Rotary Barbecue pits, just south of River Road and the Riverfront Park for RVs. "It is a bold fake, I know," Jack said as he removed the pipe from his mouth, "and a dangerous one to play, but it will be safe to keep the court running for a few weeks longer; then we will go to Hamilton." "I will have you hanged if you do," I sweetly said. He looked at me intently for an instant, then knocked the ashes from his pipe, and said lightly: "Then I am not going. Don't you want to go to my house and see Judge Paddy and the court room?" he added. I accepted the invitation. Jack shouldered the case of coal oil and we walked together among the stumps; arrived at a two-room house, small and poorly built, and which Jack and Paddy had squatted in directly after the builder and owner had abandoned, we entered. In the front room were a bedstead on which was spread a thick layer of old clothes covered by some blankets, probably those stolen from the Swede, a badly cracked and legless stove, two chairs, a broom, a few chipped dishes, two frying pans, two tin cups, a coffee pot that was far from clean, a pine table on which were a few law books, an ink pot, pens, and writing paper. If there was anything else in the room I did not see it. Paddy sat behind the table with steel-rimmed spectacles astride of his bulbous nose. He looked severely at me and admiringly at Jack. His eyes wandered toward my pocket as though to say, "It will be lighter when I get through with you, my boy." He did not smile when I complimented him on the fact of his having washed his face since I had last seen him. He listened gravely to Jack's explanation of my visit; at its conclusion he unbended and laughed merrily as he vividly painted the scenes that the afternoon would bring forth. I talked long and earnestly with the hobos two and urged them to close their court and go to work. I assured them that the future held serious trouble in store for them if they continued to run their evil course. They laughed at trouble, as is the wont of hobos, and made light of the future. A tramp steamer whistled hoarsely down the river. I bade the hobos of Sedro farewell. As I walked briskly to the steamboat landing I passed drunken men. When I mounted to the deck I looked at the stump-encumbered clearing on which Sedro stands and saw Hobo Jack inspecting the drunken men through the keen eyes of an expert to see if they had arrived at fit condition of alcoholism to be arrested. As we steamed up the river I saw Jack dodging among the stumps. I have never seen him since. Business called me from the Skagit Valley. When I returned to the fair land the other day I was told that the two hobos of Sedro had fallen into the clutches of the law, that they had been arrested and brought before a lawfully-constituted court, over which a Judge who possessed no sense of humor presided, and that my hobos had retired from business and the public view simultaneously, and I further learned that they would not reappear for some years. I grieve for my hobos. They were by far the most interesting people I met in Sedro. They, with merry tales, had aided me to pass many hours that otherwise would have hung heavily. I am grateful to them for that service, and I trust that they enjoy the memories of the days when they owned a court. This sketch originally appeared in the New York Times on Dec. 14, 1890. Ed. 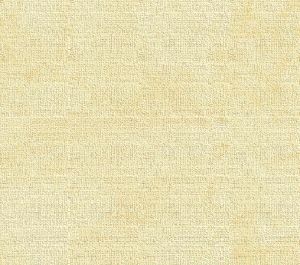 Note: Independently of Ms. McAndrew supplying this wonderful story of Jack and Paddy, we found the following excerpts from a letter that one of the Territorial Daughters pasted into their scrapbook. In 1937, pioneer J.C. "Baldy" LaPlant shared his memories of the first court case in Sedro, in prose that could have been lifted right out of a story by the famous Judge Roy Bean. In a moment of providential serendipity, Patricia found this posting in one of our earliest incarnations on the web in 2000 and sent us an email that is still one of our most precious communications. We are now collaborating on a book about Mr. Wilkeson, The Old Soldier Goes Fishing, which, after a delay, is scheduled to be published in 2011. The first court of law I ever saw convened was in the Sparks' blacksmith shop on the north bank of the Skagit river. "The law west of the Pecos"' to me was presided over by E. [Emmett] Van Fleet. The culprit was "Hobo Paddy," — accused of something or other and chained to a burned-out stump near by — the only jail this far up river. He was speedily convicted and rechained to the stump. Sometime during the night, someone supplied Paddy with a file and he proceeded to file himself free from the stump and started out to see the sights, with 10 or 15 feet of chain in his arms, still fastened to his off-hind leg, and yelling his drunken head off for another file. My brother, C.L. LaPlant, who had charge of Gus Linden's commissary, supplied the file. Incidentally, Mr. Linden had the contract for the construction of the Cokedale spur, our second boulevard out of Sedro. Links to more reading: Frank Wilkeson served as a Union officer in the Civil War and wrote a book about his experiences that rivals Stephen Crane's Red Badge of Courage. His grandfather, Samuel Wilkeson, promoted Buffalo, New York, and the Erie Canal. His father, Samuel Wilkeson, was secretary to the board of the Northern Pacific Railway. Frank accompanied D.C. Linsley on the NP survey of the Skagit river watershed in 1870 and then lived here for a few months every year, starting in the mid-1880s, and recorded his experiences for the New York Sun and Times. Through the Iinternet, we found Patricia McAndrews, an author living in Pennsylvania, who is researching Wilkeson's life for a book, and she has recorded dozens of his columns. More than half of them are about the boom days of Stehekin, Fairhaven, Sedro and Hamilton. He was a prominent boomer in the latter two towns. 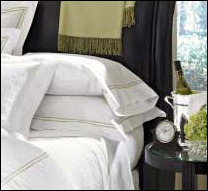 This collection is among our proudest discoveries. We have transcribed 15 for you and will share many more in the future. We hope you will enjoy them as much as we do and pass them on to your friends and family who want to read first-hand accounts of living near the river more than 100 years ago. We are converting each of the early columns to the present new domain and will complete the process by 2010. If the link does not connect, please use the search function and then email us if that does not work, either. We will send you the new link. Thank you for your patience. See a list of links to all of Frank Wilkeson's columns on our site; and see our brief profile of him, about to be considerably updated. And read about Patricia N. McAndrew's new book, The Old Soldier Goes Fishing — planned for publication in 2010, a collection of his columns and a biography of Frank and his family. See a list of links to all of Frank Wilkeson's columns on our site. You can read a bio of Wilkeson and 15 more of his columns in various sections of the website.